I have had several delightful questions sent to me about my video. 1. 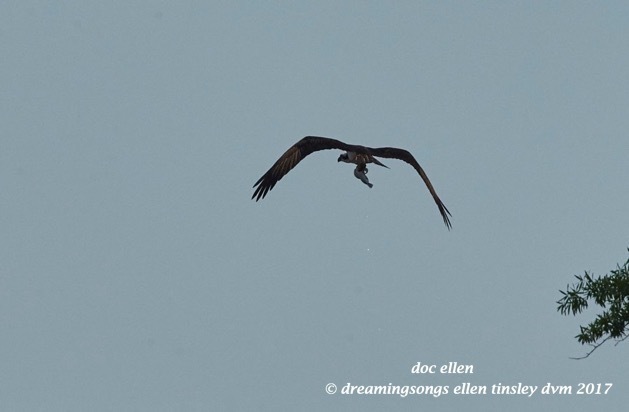 The little male osprey caught a very, very large fish. He has it tucked against his chest as he muscles the fish up. 2. 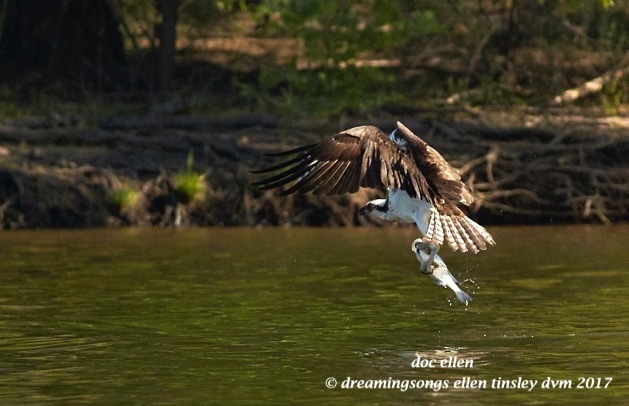 It took several tries for the osprey to lift the fish from the water. 3. The osprey got some altitude and was making the bend toward his nest when he saw the eagle heading for him. 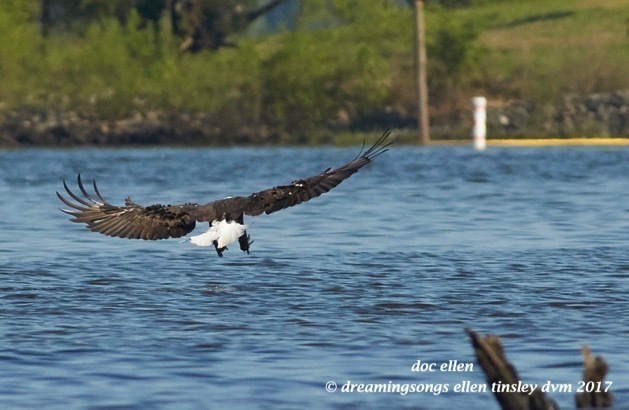 came a second bald eagle and the osprey dropped his large fish (you can see the splash). 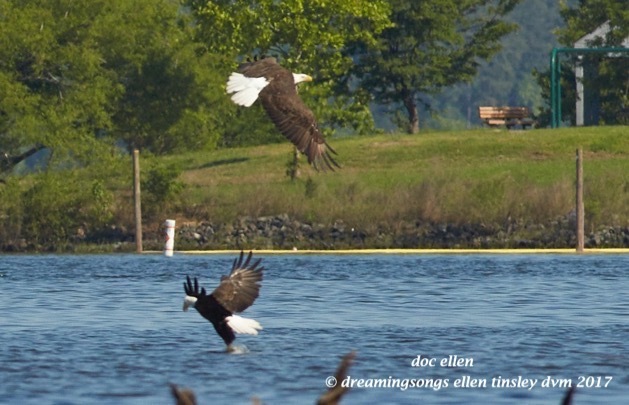 Two eagles are not good odds for an osprey to face. 6. 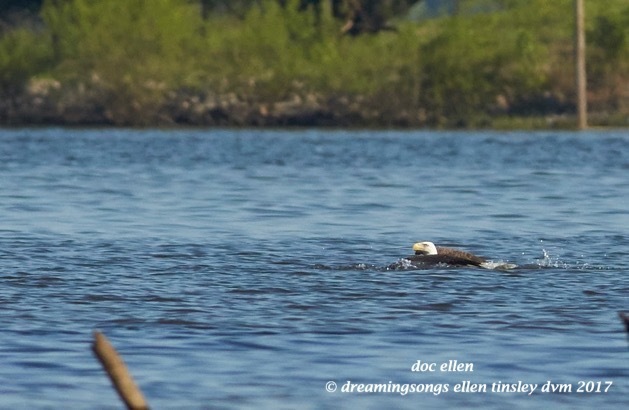 One of the bald eagles made a dash for the fish. 7. 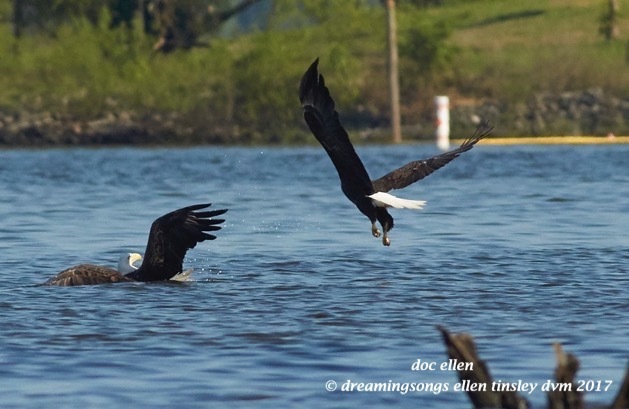 The fish was so large that the eagle was having trouble getting out of the water (don’t worry, eagles swim well). 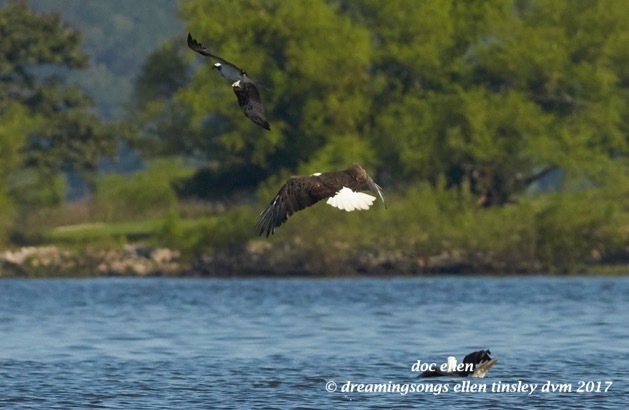 the second bald eagle made an attempt to harass the first eagle into abandoning the fish. he’s in the upper left of the photo and was easily missed in the video. 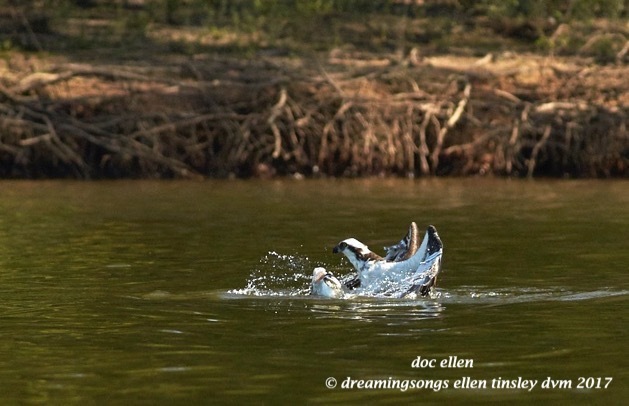 The osprey gave up the chase and the fish. 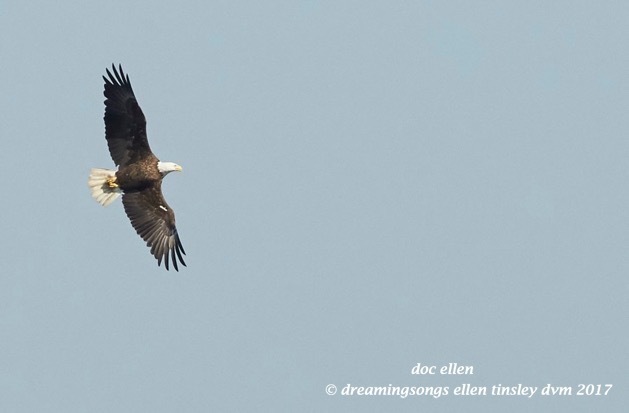 The first eagle finally cleared the water without the fish. 10. Out of the back cove, Hershey dashed in (sorry about the focus) and grabbed the fish. Whew. 11. Hersey makes the mad dash for home. 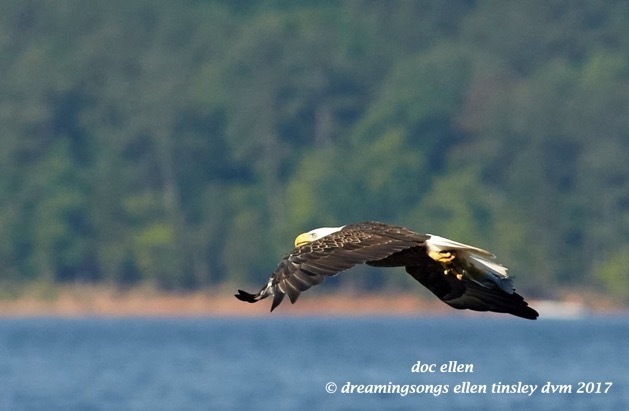 And, THANK YOU for all your wonderful responses to my efforts with the Jordan Lake Neighborhood series!! 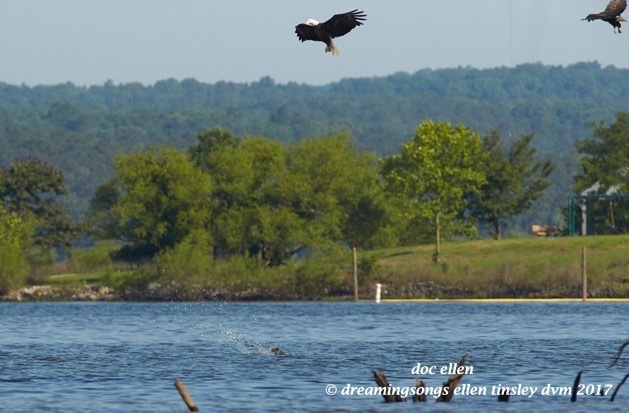 Posted in birds, Eagles of Jordan Lake, Jordan Lake, Jordan Lake State Park, ospreys of Jordan Lake, photography, raptors, wild birds and tagged as American bald eagle, bald eagle, bald eagle fishing, bald eagle flight, bald eagle parent, bald eagles of Jordan Lake, eagle, eagles of Jordan Lake, flight, Jordan Lake, Jordan Lake State Park, male osprey, osprey, osprey fishing, osprey flight, ospreys of Jordan Lake, raptor.